LAIKIPIA, Kenya (August 30, 2018) – Are Laikipia’s recovering lions turning to endangered Grevy’s zebras (Equus grevyi) for their next meal? In recent years, lion numbers have slowly recovered in this region as livestock ranching – which commonly practiced shooting or poisoning lions – has given way to wildlife tourism. Lions (Panthera leo) are classified as Threatened by IUCN. The team found that lions preyed on both Grevy’s and plains zebras (Equus quagga) far less than expected. Their data showed that the population of Grevy’s zebra populations may in fact be stabilizing with recruitment into the population tripling since 2004. The researchers did conclude that competitive displacement by livestock and interference competition for grass from plains zebras, which are 22 times more abundant than Grevy’s, are most likely the predominant threat to Grevy’s zebras’ recovery. 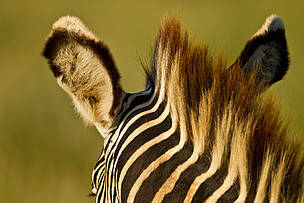 Close-up of Grevy Zebra (Equus grevyi). An endangered species commonly found in Northern Kenya, Ethiopia and Somalia.